A more interesting and remote track north than finishing the Oodnadatta Track via Marla and the Stuart Highway for those who are prepared. Expect few other travellers particularly on the Abminga 4WD track that forms part of the Old Ghan Track. The 14km of intermittent sand just south of New Crown homestead is a trudge but the reasonable, if slow, travelling along the rest of the route makes up for it. If you ever wondered what the world might look like after climate change has wrought its devastation this route is for you. Oodnadatta, South Australia to Kulgera, Northern Territory via Eringa, Abminga and Finke. 446km including the 26km Lambert Centre excursion. All unsealed. The essential Hema Great Desert Tracks of Australia South Central map is reasonably detailed. Also Adam Plate’s Pink Roadhouse annotated mud map of the Old Ghan route is very useful to show the route to take. Allow 7 days riding with maybe another day off at Eringa waterhole. March to November. It’s way too hot in summer. Finke road in orange. Permanent water points shown. The road to Hamilton Station gets an occasional grade which is not always good news for those on a bike but that section is generally as good, or better, than the Oodnadatta Track. From Hamilton heading up to Eringa the grading has ceased but the road remains mostly good. From the turnoff to Abminga it turns into a 4WD track, allegedly, but for cyclists it’s firm and always clear where to go. Some gibber plain moments are experienced, ie have I landed on the Moon? The toughest stretch sneaks up about 10km north of Charlotte Ruin, (only the foundations of the old telegraph station remain). There’s about 14km of intermittent deep, deep sand with no way around a patch of the Simpson Desert that’s drifted to the west. The sand stretches are usually only a few 100m long. Walking the bike can be frustrating at times but after about 3 hours pushing, shoving, hauling, dragging, and swearing it’s all over. The road from New Crown homestead to Kulgera is regularly graded, but is generally soft and slow. The 4WD track into Lambert Centre is a long sand pit but it can be fun to just ride through the shrubbery when you get sick of the track itself. Think about 2 hours to traverse the 13km each way. On the last day heading into Kulgera the road gradually improves, ie the surface gets harder. The last 100m are even sealed. Hamilton Station is 109km up the road and you could ask there. Permanent water at Eringa waterhole where there is a good campsite. The water from Eringa waterhole has to last until New Crown Station where you could ask politely to fill up if you manage to avoid the savage dogs. Good bore water in Finke has to last until Kulgera. You need the capacity to take about 25 litres, (man, that’s another 25kg), to last three days riding and two nights out to get between these points if you are spending the time to get to Lambert Centre, (and you gotta do that). It’s not good to run out of water out here because there isn’t much, often any, other traffic. 2 patchy stores at Oodnadatta. You could post yourself some delicacies to the Post Office which is incorporated within the Pink Roadhouse Empire. Good community store at Finke but check the sporadic opening hours. They have a siesta during the week and close from lunchtime on Saturday until Monday morning. Takeaways only at Kulgera but they do a decent cheap brekkie. The best bet from here is to stock up is in Erldunda, 71km north of Kulgera, where the Lassiter Highway turns off to Uluru. The Erldunda roadhouse has a compact store that sells the basic necessities. Paid camping at Oodnadatta, $12pp and Kulgera, $12pp. Otherwise, bush camping only. No camping allowed at Finke aboriginal community. Plenty of dead, dry firewood around. The abandoned and roofless Eringa homestead was Sir Sidney Kidman’s original station. From poor beginnings he went on to become Australia’s biggest landholder and for a while allegedly the richest bloke in the world at the time. The huge Eringa waterhole will get you scratching your head as to where it has come from considering the desolation of the rest of the countryside. The Lambert Centre is the geographic centre of the mainland landmass of Australia: latitude 25º 36’ 36.4” south, longitude 134º 21’ 17.3” east to be precise. It was calculated by taking 24,417 equidistant points around the coastline of the mainland and some number crunching to get the result. If you want to brag about going there you can hide your panniers at the turnoff. Take care with carrying enough water to last between the known watering points. The Abminga 4WD track is very remote and don’t expect traffic. Most 4WDs take the Dalhousie Springs/ Mt Dare route. This is not recommended for the cyclist for a number of reasons. The 37º muddy billabong isn’t so terrific on a hot day. (Coward Springs at 26º near William Creek on the Oodnadatta Track is much more attractive.) The treeless official campsite there is well removed from the waterhole but not from the dust, plagues of mozzies, or blizzard of stray pieces of toilet paper. The 4WD track from Hamilton Station to Dalhousie has long sections of teeth jarring cobblestone surface after which you arrive on the edge of the Simpson Desert and have stretches of sand heading off to Mt Dare and Charlottes Ruin. The Abminga route, by comparison, has a generally reasonable, and sometimes great, surface and has almost no traffic. 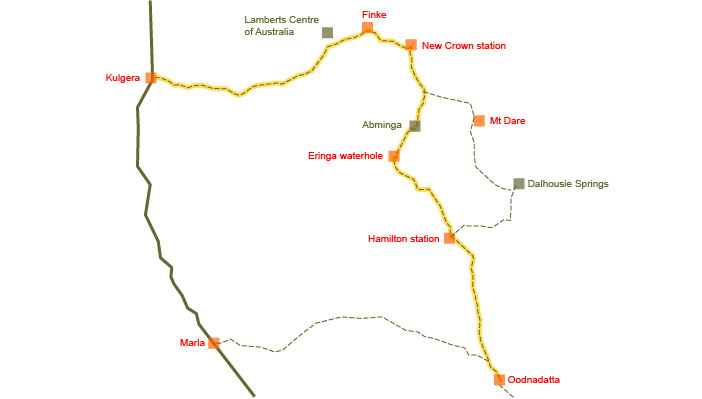 Also, don’t be fooled into taking the direct route to Alice from Finke. That track is used for the Finke Desert race in June each year but there is about 130km of intermittent sand. Ditto the Old Andando track to Alice. Only for those who felt they didn’t have enough fun in the sand pit as a kiddie, or maybe had too much. Ain’t so many who have written about this particular route but my blog from my own travels starts here: even more civilisation at Oodnadatta: and I check out the road for the next day’s ride. These 28 images give a general impression of the road conditions you are likely to encounter out there. And just a few pretty pictures too. If you are serious enough to download you might consider a massive, OK, even a minor donation via the highly secure Paypal to help in the costs of running this site. And keep evil ads from ever returning to the pages. Ta.